Student loan debt in America is now over $1 trillion. To put that in perspective, it is $620 billion more than total U.S. credit card debt. And the cost of attending continues to increase at an absurd rate. 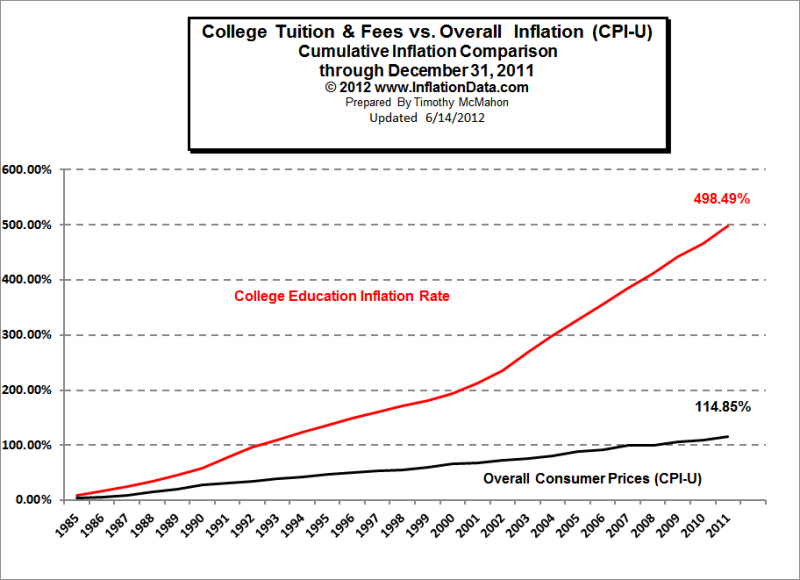 From 1985 to 2010, the cost of college has gone up by nearly 500 percent. The growth rate has far surpassed the rate of inflation. From both a financial and personal standpoint, a college degree makes no sense. Only 27 percent of college grads have a job related to their major and 51 percent consider themselves underemployed. This may come to no surprise then that young people have increasingly become disillusioned with the “American Dream.” According to a Fusion poll, 16 percent of young people said the Dream is “very much alive,” compared to 32 percent in 1986. And 29 percent say the Dream is “not really alive,” compared with just 12 percent three decades ago. We really only have our education system to blame. We tell kids that the only way to be successful is by going to college and waiting for a job to come to them. We are essentially killing the entrepreneurial spirit with a preconceived formula to a successful life. But this is plainly wrong, success is made, not guaranteed. The real key to life is getting in that entrepreneurial mindset: Knowing how to create value. It’s not something that can be learned in a classroom but from first hand experience. Being an entrepreneur means directing your own future not having it hand down by others. Manage Risk – Don’t be afraid to gamble in life but know when to as well. Always weigh and assess risk. Be Creative – Always be ready to try something new. Be eager to face the unconventional and disrupt established standards. Act Purposefully With Vision – Time is our most scarce resource. Knowing that we have a limited amount of time to achieve what we want in life leads us to act purposefully. Time is the most valuable asset you have, learn how to successfully manage it. Thoughtfully plan your days, weeks, months, and years. Think about both how and with whom you spend your time–it’s likely an indicator of what you are to become. Why waste four years and possibly $80,000 dollars or more on a computer science degree when you get right into the field with a small fraction of that at a coding bootcamp. While others are in the middle of the first year of general education courses, you would have already mastered the skill in three to six months. The return on investment is even better, the average starting salary of a coding bootcamp graduate is $75-80K. A CS degree graduate can expect an average salary of $45-106K. For a fraction of the time and money, coding bootcamp graduates will earn nearly as much as computer science graduates. Apprenticeships are another great way of acquiring necessary job skills. Instead of sitting in a dull classroom going through the lecture; you can pursue a career in a hands on environment. UTI offers programs in welding, automotive technician training, marine mechanics, and more that last less than a year. The company boasts that 4 out of 5 graduates (80 percent) get jobs in their fields of study. Students work in a real life work setting with experienced instructors. Isaac Morehouse was disillusioned by our conventional education system and set out to create an alternative. He founded Praxis, a institute that puts you in a 9 month apprenticeship at a startup of your choice and walk out with a full time job. The company prides itself in having 98 percent employment upon graduation, an average salary of $50k, and a zero net cost program. Praxis success has landed Isaac with numerous interviews, the most recent with Tucker Carlson on Fox.